Despite the intellectual carnage caused by extreme Trumpification, one would guess Republicans are still capable of mustering a cogent argument against massive tax hikes. It was the tax issue, after all, that created the modern GOP. The 2017 Tax Cuts and Jobs Act remains the Trump GOP’s biggest legislative accomplishment. And it should be easy to find economists on the right and left to question the wisdom of raising taxes when the American economy is experiencing a historic downshift in its growth potential. But all it took was a few breezy comments by superstar House newcomer Alexandria Ocasio-Cortez to show that capability has severely atrophied. 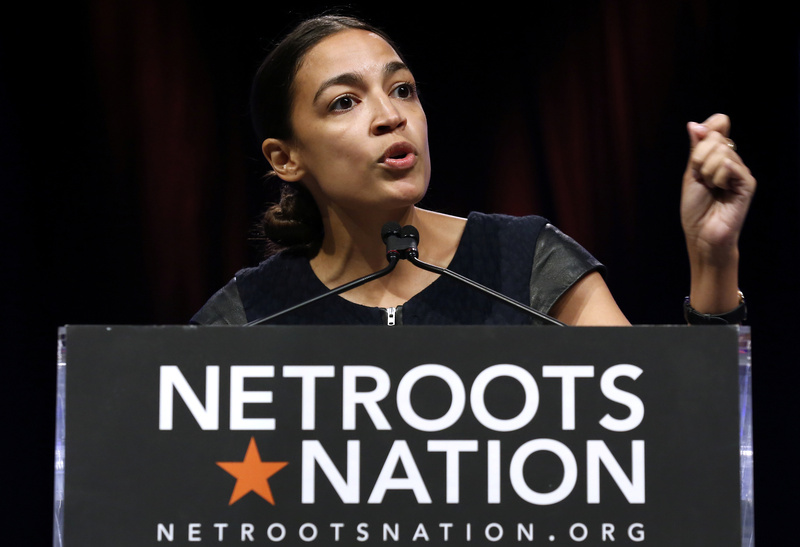 On 60 Minutes, Ocasio-Cortez said her “Green New Deal” idea would require that “people are going to have to start paying their fair share in taxes.” Specifically, she continued, those at the “tippy tops,” might see incomes of $10 million and higher taxed at a marginal rate of 60 or 70 percent vs. the current top rate of 40 percent. Now this should have been a gimme for conservatives, no matter how Trumpy, because progressives’ numbers don’t add up. When the U.S. did have sky-high tax rates, for instance, they applied to few taxpayers. Indeed, countries that currently have much higher top tax rates — such as the Scandinavians — apply those rates to income levels much lower than what Ocasio-Cortez is suggesting. A lot of people pay them, not just millionaires and billionaires. If the U.S. had a tax code like Denmark, notes the Tax Foundation, all income over $60,000 would be taxed at 60 percent. And in addition to high income and payroll taxes, Scandinavian governments hit their citizens with steep-value added taxes to finance their more generous welfare states. If AOC-style progressives want to mimic how the Swedes and Norwegians spend — with a Green New Deal here, Medicare-for-all there, job guarantees everywhere — then they also have to mimic how they tax. That’s just the obvious, hot-take critique. A deeper analysis might have noted, for instance, that little is known about the impact of very high tax rates on how taxpayers choose careers and the follow-on impact on economic growth. America has long benefited from the willingness of its people to take big risks to, say, start a search engine company or online retailer. Risk taking is influenced at least to some degree by hopes for an eventual big payoff. “Significantly reducing that possibility by hitting those individuals with extremely high income taxes is of first-order importance in determining the optimal top tax rate,” my AEI colleagues Aparna Mathur, Sita Slavov, and Michael Strain argued in a 2012 research note. But such a meager attack isn’t really that surprising when one recalls how the 2017 tax cut was sold. Republicans promised it would quickly supercharge growth as companies brought back overseas profits and invested them here at home. But that isn’t happening so much, not that economists are surprised. So with Republicans having lost much public trust on tax cuts with dodgy justifications, explanations, and predictions, they now seem determined to repeat the error on tax increases. Given that top tax rates have fluctuated between 30 and 40 percent for more than 30 years, a stark deviation once seemed unlikely. Now in a time of higher debt and inequality — and weak intellectual defenses of light taxation — maybe not so unlikely. With the US economy generating lots of jobs and higher wages, is American capitalism still broken? Democrats have some big policy ideas for the 2020 presidential election. But have they thought hard about the downsides of them?